Daniel Cormier defeated Stipe Miocic for the UFC heavyweight title on Saturday and his good friend Cain Velasquez was watching backstage. Daniel Cormier won the UFC heavyweight title on Saturday evening after knocking out Stipe Miocic at UFC 226. One man who helped him prepare for his eventual triumph was his American Kickboxing Academy teammate and former UFC heavyweight champion Cain Velasquez, who watched the fight from Cormier’s lockeroom. Posting on his Instagram account earlier today, Cormier released a video of Velasquez’s reaction to his win backstage. Suffice to say, Velasquez looked delighted for his teammate. “Saturday was a great night, but not just for me at the @americankickboxingacademy we are a family. Here is @officialcainvelasquez , @slikbxr and @iamthebay watching the fight in the locker room. Speaking in the UFC 226 post-fight press conference, Cormier paid tribute to his friend Velasquez and the role he played in the lead up to the fight on Saturday. “The reason the fight was so easy today was because for the last 8 weeks I’ve been getting beat up by Cain Velasquez,” Cormier said. There’s been no clear timetable given on Velasquez’s expected return, but he will no doubt have his own eyes on reclaiming the UFC heavyweight title when he does. Velasquez last fought back at UFC 200 when he defeated Travis Browne via first round TKO. 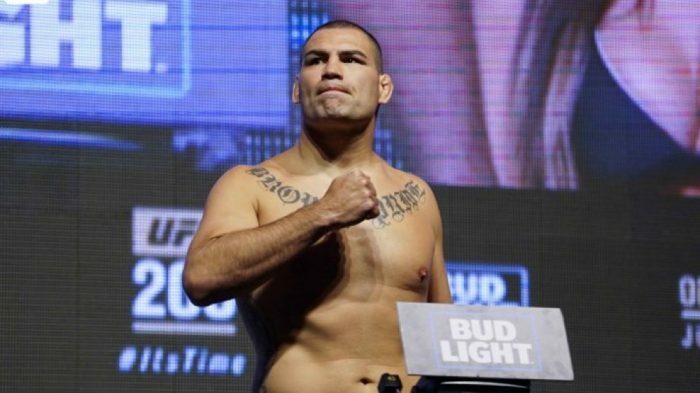 Velasquez was then expected to fight Fabricio Werdum at UFC 207 in Dec. 2016, but was pulled from the fight by the Nevada State Athletic Commission after stating in interviews and a medical examination before the fight that he was suffering from back problems.